The Lawn Barbecue is coming! 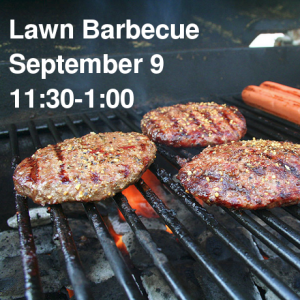 Please join us on September 9, 2018, after worship (about 11:30-1:00) for the annual Lawn Barbecue. Let’s celebrate a new season and the bounty of our garden as we reconnect with each other after the summer and anticipate an exciting year ahead. As we did last year, we will set out a basket for donations to offset food costs. There are other ways you can contribute too. If you would like to bring a dessert or salad, or would like to help with setup, cooking, or clean up, please email the church office so that Laurel can put you in touch with John-Peter Smit or Lauren Matheson.